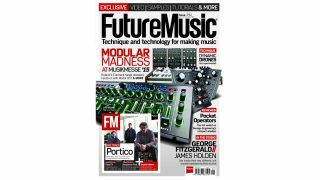 After NAMM - which we covered back in January - Frankfurt Musikmesse is the biggest event in the annual music technology calendar. As ever, FM were on the ground to check out all the latest developments and hottest new gear announcements. There were several show-stopping reveals at this year's event, with at least three exciting announcements coming from one company alone: Roland. Not only did we manage to get fully hands-on with their hybrid beast the JD-XA, but we got our first glimpse of their foray into the realm of modular synthesis, with not one but two Eurorack systems unveiled. Grab the issue now to see all the show highlights. In this month's modular column we test Dave Smith's pair of Eurorack offerings and explore the capabilities of spring reverb. Foley FX- Add some real world textures to your tracks with this pack of 'found' dramatic sounds. Sequencer Funk - The classic sound of funky arpeggiator and sequencer-powered basslines and leads. Guitar Loops - Get all the six-string action you'll ever need with this assorted pack of loops and lines.